We all know how elusive justice can be. But just try seeking it after a family member has been murdered–a victim of gun violence. Amisi Kachepa, the self-professed killer of my cousin, 26-year old Stephen Guillermo, was released from San Francisco County jail this week. The SF District Attorney George Gascon’s office said there just wasn’t enough to hold and charge Kachepa for murder. It was a shock to my family. Kachepa, 68, is twice the size of my cousin Stephen, who was slight, unathletic, and small by comparison. Much has been made of his inebriated state, but Stephen was sober enough to text, responsible enough to have named a designated driver. He wasn’t a threat to anyone. Most important, he was non-violent and unarmed. A guy who, as his sister Sharmaine said, was recently scared of a bee and didn’t want to swat at it. It was all in keeping with his gentle nature. He had immigrated here from the Philippines at age eight. He lived with his family in a small apartment in the South of Market. And when his father died a few years ago, he took on two jobs to support the family, went from older brother–“kuya”–to surrogate dad. All that and he kept up his studies at San Francisco State so he could graduate in June. No wonder he felt he deserved a special night out with friends on what was a three-day weekend for him. As Friday night passed into Saturday morning, May 3, his fatal mistake was going home and taking the elevator to the wrong floor. Instead of his 5th floor apartment, he went to the identical apartment on the 3rd floor. We found out what that meant this week. Kachepa was freed Tuesday night. When my family met with San Francisco Police Chief Greg Suhr on Wednesday night, we wanted to know exactly what kind of re-investigation would take place. And it also meant looking into additional background of the suspect. The chief admitted the chance was “slim” of finding anything new. By the close of business Thursday, the “re-investigation” was sent back to the DA, without a chance for anything really substantive to be done. Indeed, when the directive came back so general, without a specific list of things to gather or look for, I knew this was just a pro forma double-checking. Must not have been many stones to turn. Should I have hope that the DA looks at it with new eyes? Or is this a “when pigs fly” situation? IS THE KEY WITNESS BEING DISCOUNTED? Forget all the speculation on the internet. With Stephen dead, W appears to be the most credible witness on the same floor as the killer. W spoke to police investigators, but the DA seems to have given short shrift to her direct experience. W didn’t see anything, but she heard the sounds of the murder from behind her door in the apartment across from the crime scene. At a rosary night this week when the family prayed for justice, W told us what she told police investigators. Before the murder, she heard nothing out of the ordinary. No drunken man stumbling to the apartment. No keys jangling trying to unlock a door. No banging on the door. No breaking of a doorknob or lock. No screams. No conversation. No noise at all. There was nothing to indicate a break-in or some kind of intrusion. A door knob has since been removed, likely for evidence. But just the knob handle. The lock was still in place. It suggests that someone was let in, by unlocking first a knob lock and then the second lock–a deadbolt at about eye level. The deadbolt from what I have observed is not damaged at all, indicating that any entry would have to be initiated from inside the apartment by Kachepa. This was not a break-in. Nor a home invasion. The entire scenario appears to have been enabled by Kachepa, who must have opened his secure door to let Stephen in. On the third floor, W said she could hear everything that happened in the hallway. “It all echoes in the apartment,” she said. Especially at 1:40 a.m.
W says if Stephen were let in, “he’d be scared. I don’t see him making the first move.” And he’d go in willingly, thinking it was his apartment. W says she didn’t hear any conversation at all. Instead of any dialogue, she heard the gunshot. It was soon followed by Kachepa banging on her door–she recognized his accent. “‘Let me in, let me in,’ he was saying,” said W. “‘Call the ambulance.‘” But W was too scared and told him she’d call 911 on her own cell phone, which she did. The security guard downstairs had already called 911 when he heard the gunshot. A second security guard was called in, and he told W that he saw the body of Stephen inside the apartment slumped over on a small cot. W told me that she thought Stephen had been shot after he plopped down on the cot. W says Kapecha was so much bigger than Stephen that she couldn’t imagine the need for deadly force. These are important details that should be in the police report that the family has not been privy to. Indeed, the family has been kept in the dark about the simplest details. At our meeting the other day, the police chief told the family that the weapon was a handgun. But was it legal, properly registered, licensed and owned? He seemed to infer that it was and didn’t say more. He was just adamant that it was legal to have a gun in the home. The point the family wanted to make was that Kachepa’s release meant that he could freely return to his apartment, and re-arm. Later, in a public meeting, the chief indicated the police kept the murder weapon. It was Kachepa they let go. Why? Criminal defense lawyers tell me that DAs are political beings, and Gascon is no exception. They all play to win. And they only play when they can win. That’s like the poker player who only plays when he gets pocket Aces or Kings. But, as they say, Kings and even Aces can be cracked. The DA seems to be anticipating the suspect’s invocation of the “Castle doctrine,” a form of “Stand Your Ground” that exists in Cali fornia. It’s based on the idea that “your home is your castle.” It justifies lethal force if there’s been an illegal entry into your home and you feel a reasonable threat of some kind. DAs must fear what going up against Castle might do to their win-loss records. Instead, they should be thinking about the senseless deaths that can result from trigger-happy gun owners who shoot first and answer questions later. As I said to the SF Board of Supervisors and the SF Police Commission, this should be the case San Francisco uses to get greater clarity on when a gun can be used responsibly in the city. That can’t happen until the suspect is charged. My family believes if Amisi Kapecha is charged, he will be forced to account for his actions. And why not let the system–a San Francisco jury–decide whether guns should be allowed to rule the city? Why do gun owners believe they are free to use their weapons–even in error–without consequence? 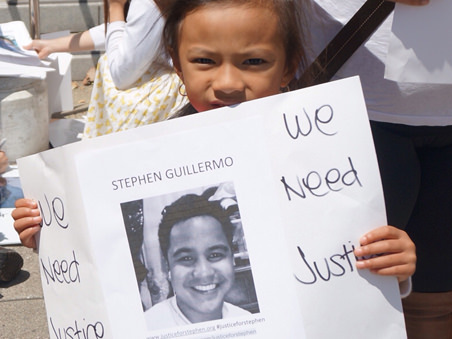 Police Chief Suhr seemed to prepare me for the worst when he said proudly that there is no statute of limitations on murder, suggesting that the Guillermo family may get justice some day for the death of Stephen Guillermo. If it’s sooner than later, DA George Gascon must elect to do the right thing now.